So here is what I came up with, Mama’s Mocha! I am seriously in love with subtlety of the cacao rounded out with the vanilla. It is seriously delish. Even my kids enjoy their doctored up ‘hot cocoa’. 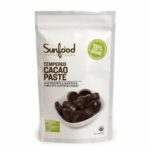 There is one secret weapon that I do use, Sunfood’s Tempered Cacao Paste. While I love Raw Cacao Powder, I find the paste really allows me to use it in other applications and still retain its rich flavor and smooth texture. Where the powder can be a bit of pain and have that chalky texture that I do not like in my drinks. A little head-up here. It really isn’t a paste…it is more like very hard chocolate candies. So,get out the meat tenderizer and go for it!! But without further ado, here is my adapted recipe! 1-2 Tbsp Coconut Oil Cold pressed is best! 1-2 Tsp Cacao Paste This is strong so use according to your taste! Add in Butter, coconut oil and tempered paste to hot coffee. Let sit for a few minutes to allow the paste to soften. Then blend to emulsify fats. Add in vanilla and stevia to taste and ENJOY!